This duo worked together from 2006 until 2017. “they stand out in the classical music world, to be sure, and they are terrific musicians with engaging personalities, too.” (American Record Guide, Feb. 2014). 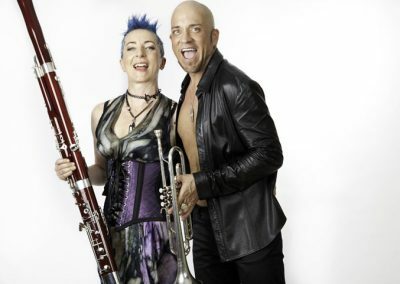 Known internationally as soloists, chamber musicians, recitalists and even fashionistas, Guy Few and Nadina Mackie Jackson performed in Canada and the USA as concerto soloists, multi-instrumental recitalists and recording artists. 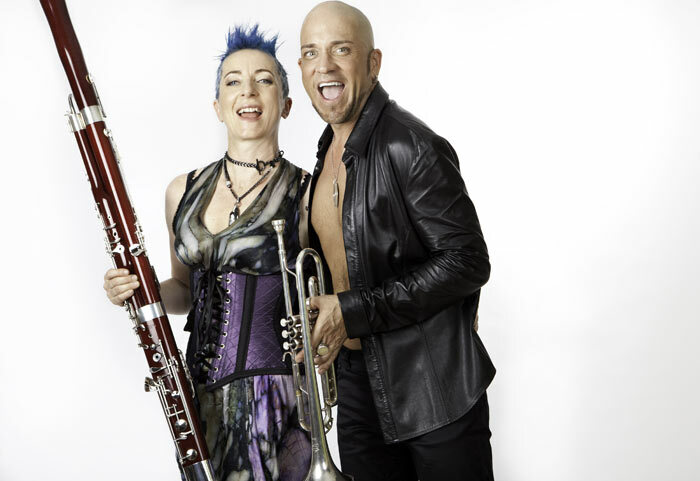 In the 2011-12 season, Guy & Nadina toured in British Columbia, the Yukon and the Prairies and were featured at the Oregon Bach Festival. The 2012-13 season saw them in Ontario and Atlantic Canada. 2014 saw them concertizing across Canada presented by the Manitoba Chamber Orchestra, Prairie Debut, presenters in Ontario and British Columbia and with the Okanagan Symphony, Orchestra Toronto, Orchestra London Canada, group of twenty seven chamber orchestra (Toronto) and various chamber performances. Acclaimed recording artists, Guy & Nadina released three blockbuster CDs, each one expanding the concerto repertoire for trumpet and bassoon. Bacchanale (with Toronto Chamber Orchestra and Kevin Mallon), won “Best Classical Orchestral Album 2009” from Just Plain Folks Music Awards. Romanza (with TCO and Nicholas McGegan), was a media favourite, garnering rave reviews from International Double Reed Society and International Trumpet Guild among many others. After Hours gave everyone a taste of the duo’s favourite pieces which they often performed live. Canadian Concerto Project, a recording that was nominated for a 2014 Juno award and nominated in 2017 for Best Classical Album with Just Plain Folks.This CD explores various styles of music including contemporary jazz and from the inspiration taken from exotic locations. Named “Canadian Album of the Year” by Mark Turner, of Classical Connection on CFCR 90.5FM, the Canadian Concerto Project features works by Mathieu Lussier, Michael Occhipinti and Glenn Buhr with Guy & Nadina, group of twenty-seven chamber ensemble under the baton of Eric Paetkau. Nadina worked with composers and organization to have many new works created for trumpet and bassoon since 2006. Through the support of CBC, FACTOR and the Ontario Arts Council, the repertoire has expanded to include four double concerti for trumpet, bassoon & orchestra, one triple concerto for trumpet, bassoon, harp and wind symphony and two symphonic poems along with many smaller gems. As dedicated teachers and music advocates, Guy & Nadina are in great demand as speakers, master teachers and interpretational coaches. Their hosts have included the University of British Columbia, Ithaca College, Scotiafest, the University of Manitoba, Mount Royal University and many others. Guy maintains a studio at Wilfrid Laurier University, teaching trumpet and coaching chamber music. Nadina teaches at the University of Toronto and The Royal Conservatory’s Glenn Gould School. Double Concerto by Mathieu Lussier for trumpet & bassoon with string orchestra, premiered 2007, 2010 Grand River Baroque Festival ;2014, Okanagan Symphony Orchestra led by Rosemary Thomson; April 4, 2014, Kelowna Community Theatre, Kelowna, B.C; April 5, 2014, Cleland Community Theatre, Penticton, B. C.; April 6, 2016, Vernon & District Performing Arts Centre, Vernon, B. C.
CHILDREN’S SHOW: A delightful story of discovery, magic and music as the forever child of Buzz discovers the trumpet, and is led by the mysterious, glittering bassoon-wielding Crow to discover the full range of music’s gifts. Programs include Word Play, Blast from the Past, Shades of Play, Romanza, Bacchanale, Carnets de Voyages and Travel Book.